The effects we create can’t be undone once they manifest. They happened. The power to create change comes from our free will choice to do so, based on the effects that exist now. I will start with the middle and give a brief overview of the Trinity of Consciousness (thoughts, emotions and actions). If you want to learn more more, I have a previous infographic, audio and video on Unity Consciousness which covers some of this as well. The blue represents the internal expressions of consciousness, which are thought and emotion, while the red represents the external expression of consciousness, which is our actions. Consciousness can also be categorized as a causal power to generate effects into reality, as such we are causal agents. We can “create” things within our consciousness, such as a fork, and then have a salience and value applied to its importance, where we can then choose to act upon creating, what at first only existed in the light of our consciousness into the real light of reality as, an actual fork. The fork started as a cause created in consciousness, and then consciousness culminated that creation into an actual effect that was generated into reality through action. When we begin life as a blank slate, we slowly start to receive input from our environment through our senses that feed us data, information or knowledge about reality. This is an automatic input stimulus that our consciousness can then process at both a subconscious or unconscious level, and at an active conscious awareness thinking level. This can be referred to as our mind or consciousness, in an active sense, where we engage in processing through logic to filter the data and find any inconsistencies or contradictions, in order to generate a more accurate understanding of reality within us. This forms our perception of reality, our individual internal subjective map of the objective external territory. Thinking alone is not enough to make a decision. An emotional capacity for salience, valuation and weighing, what is and isn’t more or less important to us, is required. We care for some things more than others and this is from our emotional capacity that also processes information we receive, and the thoughts we generate. Our thoughts and emotions feedback in our internal consciousness processing, at both an unconscious or subconscious, and consciously aware level. Our “mind” and “heart” are symbols to refer to our consciousness, not to literal organs within our bodies. When a degree of certainty has been achieved within the first two internal expressions of consciousness (which can be referred to as a unity, harmony, integrity, balance, etc. within a person themselves of their own confidence to do something), then they engage in the output phase where they have the courage and willpower to act. Wisdom is about our actions. Although you can have unity within your two internal expressions and also your external expression to act in accordance with how you think and feel about doing something, it doesn’t mean that what you are doing is actually wise. This is not simply being united within a false thought, supported by feelings that validate that false conception, and then to act upon that falsity to create into reality. That is acting, not in wisdom, but in foolishness. True unity consciousness requires that we be in unity with reality, existence, truth and moral truth. This is how we generate actions and behavior that are wise, and not foolish. We have free will choice to create effects into reality. These are our actions and behaviors. 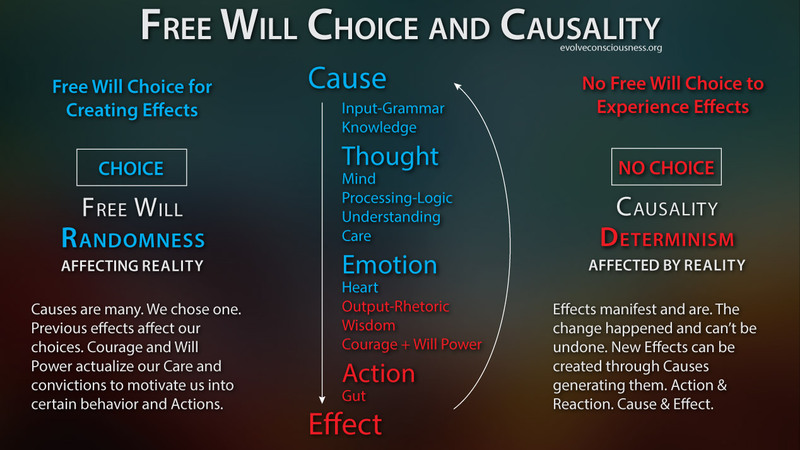 With our free will we can engage in random outcomes that affect the reality everyone else is also in. No one has access to our consciousness to determine what we will do at all times. Despite tendencies in behavior and conditioning to do certain things, we can always change our mind and do something else. We have the capacity for caring or apathy, rationality or irrationality, and also the power to create great evil or great good in the world. It comes down to our choices, and if we are thinking about what we do, or simply just do things without thinking about them deeply enough. Things that are a certain way in our world can be changed. They are the effects that we have generated and created the world into. If we understand how things got this way, we can change our way of thinking in order to change our way of acting and produce a different way of living in the world. The potential choices we make are the causal forces to generate effects in the world. There are many potential choices and causes that we can manifest. But we choose one each time we make a decision. We choose one out of the many possibilities to create a future according to how we act. This is the power we have to affect and create the human world around us. We don’t literally create the world, because there was a world that existed long before human animals came along. There is an objective reality that has many preexisting effects that will affect our choices. All of the information in reality is input as knowledge for us to process. Everything that exists, automatically has a degree of effect upon us, by default, through our becoming aware that it is there and exists. This will affect our understanding of reality and our future choices in reality. What we receive as input matters, and what we care to have convictions about, will motivate us to act. If we receive low-quality input or knowledge, then we will be processing low-quality information, and producing low-quality understanding, in order to produce low-quality actions. What goes in gets consumed to become what goes out. Low-quality in, low-quality out. Garbage in, garbage out. Caring about inputting quality knowledge and truth is important in order to process that quality about reality, into our understanding of reality so that we can then output, generate and navigate reality more effectively. This is why truth, and more specifically moral truth, is what determines the quality and condition of our individual and collective lives together as a society or community. The previous section was about us, consciousness, and our free will choice in how we can generate, manifest, and create effects into reality. When we generate an action into reality, or others generate an action into reality, then that action has been created and has come into existence. We have no free will choice to not experience those effects. They happened, and if we are there, we’re going to experience that reality of those effects. Whatever happens in reality, we don’t have a choice over it having happened. We are not the ones who create what everyone does in reality. Each consciousness is its own random free will choice generator of actions. Once someone does something, that is a deterministic causal force that manifests in and affects reality, and we are then affected by reality. This is how there is both determinism and randomness, both causality and free will choice. Reality itself, is not a human animal, or another animal, and doesn’t have consciousness nor free will. Reality itself, existence, is a grouping order categorization to reference everything that is, which can also be called the universe which means everything rolled into one. The universe, reality, existence, and truth are synonyms for that idea of everything as one, all as one. But reality is not a consciousness. Consciousness exists where it exists as being demonstrable to exist, and that is found in the animal kingdom. Whatever has consciousness, has a degree of free will to operate beyond simple natural laws found in the universe that affect anything that those laws apply to. Causal agents can create additional stimulus into reality that will act as an additional source of input and generation to affect the causal interchange that existed prior. Effects manifest, and are. They become what ‘is’. The change happened and can’t be undone, no matter what you believe. Once a plate is shattered it can’t go back in time to become unshattered. You can generate new causes and glue the pieces back together, but you can’t reverse the effects of what happened to the plate. Effects happen and can’t be changed, but new effects can be created through causes generating them. New effects can be from the natural laws and forces of the reality in universe, or they can be from the random power of consciousness to engage in free will choice and generate things outside of those natural causal forces, that would not have existed had the consciousness of a causal agent not created it. Everything in the world and in the universe, is affected by causal forces and laws. This is action and reaction, cause-and-effect (determinism). But we, human animal consciousness, have the greatest power of consciousness out of all the animal kingdom, to affect the greatest degree of change upon the universe, reality and existence (free will choice). With great power comes great responsibility. Consciousness is a double edged sword. We have great power to create good or evil. We must develop the knowledge of understanding ourselves, to comprehend the power we are using now, and the potential power we have to change things.